Direct Ocean Breathtaking View!! Chadham by the Sea 2nd Floor north bldg. Get away from the crowds!! Our condo at Chadham by the Sea is in a small gated 52-unit complex one mile from a national seashore - we're the last condo south on the 'non-drive' beach. * Access to beach in less than a minute! * 4 flat screen TVs - living room/kitchen and all 3 bedrooms! * Updated fully stocked kitchen, down to the spices! You are free to explore before booking - use Ask the Owner a Question. Or if you're ready to book use the Book it Now process. New Smyrna Beach is one road up and down the beach; easy! So why be crowded on the north end; come on down to the south end (5 minutes by car) and have privacy and peace of mind on the 'no drive' part of the beach. For the continued comfort of all of our guests, we do not allow pets or smoking inside (ok to smoke on balcony). * Maid Fee: $100. Resort Tax: 12.5% added to Rental and Maid Fees. Credit card fee if applicable: 3.5% (charged to deposit) or 6% for international cards. * VRBO charges a service fee on a sliding scale. * Check In: 3 pm & Check-Out: 10 am. * Deposit and VRBO Service Fee due with Registration. * Final full payment of Rental due 30 calendar days before 1st day of rental period (or 60 days manually for international travelers). * Cancellation: forfeit Rental funds if cancel less than 30 calendar days and Owners are not able to re-rent the cancelled timeline (Monthly rentals have different Policy that will be explained in my Quote). *Payment required in U.S. dollars from U.S. bank - international travelers please alert me so we can arrange payment plan to avoid 6% fee. *VRBO's payment system required for first payment. Payment options include echecks (free to you and me) or credit cards (3.5% fee domestic and 6% international) passed along to you via withheld from deposit). Corporate CPA in Atlanta, Ga, starting w Touche Ross many, many years ago. Have worked on or for: City of Atlanta, Bi-Lo Grocery, Atlanta Committee for Olympic Games, Harbinger, Crown Crafts, The Home Depot, Genuine Parts, BASS (Holiday Inns). Executive video producer in Atlanta, Ga, serving corporate video needs. Clients include Delta Air Lines, World Airways, the Carter Center, Novelis, Georgia Public Broadcasting, Hip Hop Awards, The Bill and Melinda Gates Foundation,and MPacts. We looked all over Florida and fell in love with the small town 'old Florida' feel of New Smyrna Beach. It was also close to family and attractions in Orlando. We prefer the east coast of Florida to the hotter muggier west coast. We love it there and can't visit enough...future retirement location and happy to share it with guests until then! We have gotten lots of wonderful feedback on our place from guests. We watch dolphins from our 2nd floor balcony in the mornings and then in the evenings stroll across the street to the intracoastal and watch the manatees play. We are across from JB's Fishcamp (restaurant). On the 'non-drive' beach. Salt-water pool...if you haven't tried this it is luxurious!!! Small complex; not overrun. One mile from National Sea Shore. toilet, shower, In Master Bedroom; 2 sinks; roomy shower. No need to leave the 2nd floor balcony; we're right on the ocean! not usually needed but we have central heat and air. gated outside parking; room for boat or other. Required to display parking pass. Private Wireless specific for our unit through BrightHouse. Code supplied after final payment. bath wash cloths and towels and beach towels. Private WiFi specific to our unit through BrightHouse. Code supplied after final payment. On the ocean; terrific view through glass patio door. Electric; one unit for cooktop stove with radiant elements and oven together. We provide the filters. Uses ground coffee; not pods. Fully loaded with all dishes and cooking necessities! Table for 6 and also kitchen high top counter with 4 stools. 55' flat screen in living room; all bedrooms have flat screen TV's: 55' in master and 42' in second and third bedrooms. Comprehensive TV stations on all TV's. Channel listing provided in the condo. Board games in the unit. Movie videos in the unit. 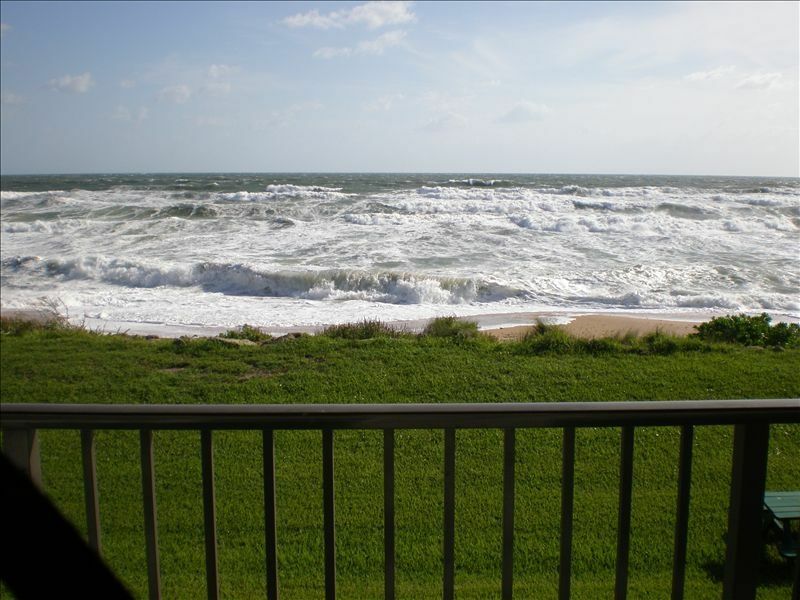 Oceanfront...great unobstructed views from 2nd floor balcony! Table and 4 chairs plus lounge chair; not to be moved to the beach. JB's Fishcamp across the street. Manatees frequent the intracoastal across the street! NSB has 2 courses; plus Daytona has LPGA course public. List of courses in the unit; multiple golf courses in the area outside NSB. Saline pool; seasonally heated. Wonderful! The Condo HOA provides chairs at the pool...but these are not to be moved. Ceiling fans in all rooms, Wi-Fi, Elevators with Carts (or stairs to our 2nd Floor Unit in 5-Story Building).